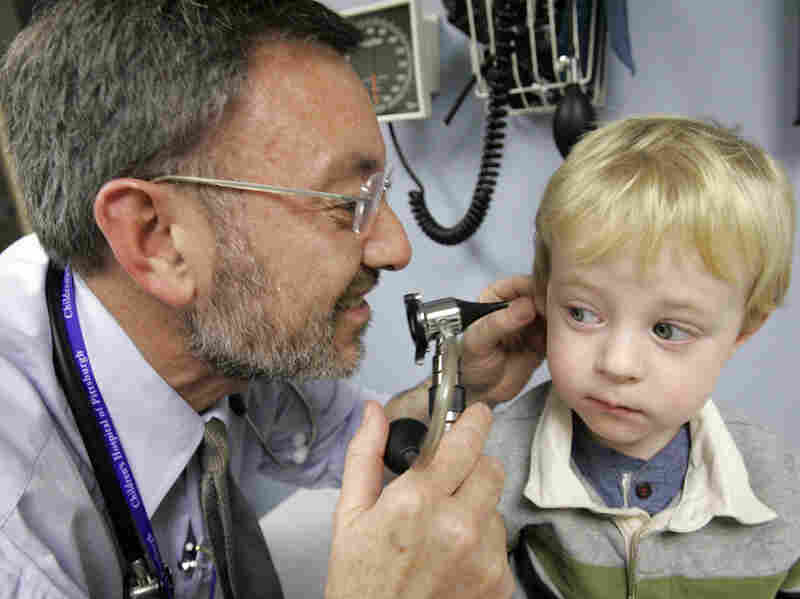 Pediatricians Urged To Treat Ear Infections More Cautiously : Shots - Health News The new guidelines for treating childhood ear infections are intended to reduce unnecessary antibiotics use. They say doctors should look at the eardrum to make sure a child really has an ear infection, instead of relying on symptoms. And if the child doesn't have severe symptoms, see if the ear gets better on its own. Giancario Gemignani-Hernandez, 2, of Pittsburgh has his ear examined by Dr. Alejandro Hoberman. Every year, millions of parents take their children to the pediatrician for ear infections, and most of them end up going home with antibiotics. In fact, ear infections are one of the most common reasons kids see doctors and the leading reason kids get antibiotics. "Parents, if their child is up all night screaming and tugging the ear, they want something to make the child feel better," says Dr. Richard Rosenfeld of the State University of New York Downstate Medical Center, who helped write the new guidelines. But about 70 percent of children get better on their own within two or three days, and about 80 percent are better within a week to 10 days, he says. And he says there are some real downsides to using antibiotics when they're not necessary: They can cause upset stomachs, allergic reactions and other problems. And they can contribute to the development of superbugs — infections that are getting harder and harder to cure. "The bacteria that do survive the antibiotic get tough, and next time you get an ear infection or any other type of infection, they're harder to manage," Rosenfeld says. "There are dozens of reasons an ear can hurt," Rosenfeld says. "In this guideline we say, 'Listen, if you're not sure of the diagnosis, don't even think about giving an antibiotic. Please, don't even think about it.' "
The only way to know for sure is to take a close look at the eardrum and see if it is clearly bulging. "If it's pushed outward — looks like it wants to pop — that is a very, very accurate sign of an ear infection," Rosenfeld says. But even kids who really do have ear infections don't necessarily need antibiotics. The guidelines say doctors have the option of just watching kids who don't have intense pain, a high fever or other symptoms of a severe infection. "You don't have to freak out as a parent. [Ear infections] tend to go away on their own quite often with just some pain medicine," Rosenfeld says. But there are some kids who definitely should get antibiotics, such as those ages 6 months to 2 years who have infections in both ears or any child who has severe symptoms, such as severe pain for several days and a fever of at least 102.2 degrees. Any child who has a ruptured eardrum should also get antibiotics, according to the guidelines. "If you have a severe infection, no point discussing it further. Those children are going to get antibiotics. And the reason is they'll get the most benefit," Rosenfeld says. Other experts praised the guidelines. But some worry they might make some doctors a little too hesitant to use antibiotics. "When the diagnosis is correct, then antibiotic treatment is never wrong," says Dr. Ellen Wald of the University of Wisconsin School of Medicine and Public Health in Madison. "Kids tend to recover more often and they recover more quickly if they're treated appropriately with antibiotics." That's especially important for working parents, Wald notes. "We live in a society where there is so much pressure for both parents to be working outside the home and it's just complicated when our child is sick. Besides which, there's always parental anxiety and concern when their child is sick," she says. Rosenfeld stresses that doctors are free to figure out the best way to treat each child. In many cases, they can give parents a "safety net" or "wait and see" prescription and say: "Hold on to this antibiotic. Give some pain medicine the first day or two. And if they're not better after two days, then we do want you to let us know and start the antibiotic," Rosenfeld says. "But if they are better, just throw it out and they'll do fine." The audio of this story, as did a previous Web version, incorrectly refers to Dr. Ellen Wald by the first name of Beth.